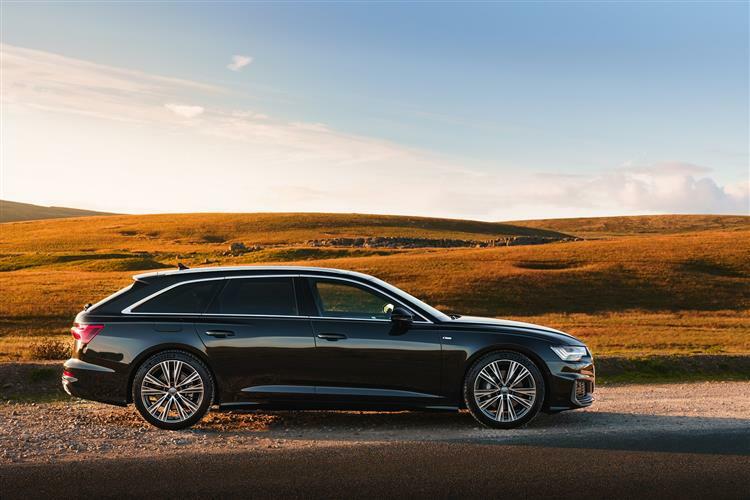 Audi's much improved fifth generation A6 Avant is a large, luxurious estate that combines practicality with panache. In this form, it's even higher-tech, better finished and cleverer than before and aims to offer buyers a little more charisma and driving reward than the previous version could have. You can see why so many buyers in this segment like it. 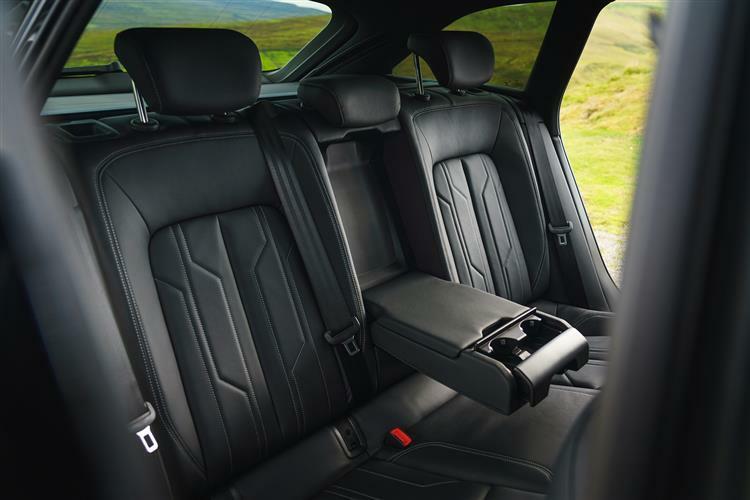 The beautifully finished Audi A6 Avant demonstrates that practicality needn't be prosaic. Jonathan Crouch reports on the fifth generation version. Audi may not be too far ahead of its arch-rival BMW in terms of overall sales but in one segment at least, the Ingolstadt maker comprehensively beats its closest rival: that of large, luxurious Executive-class estates. 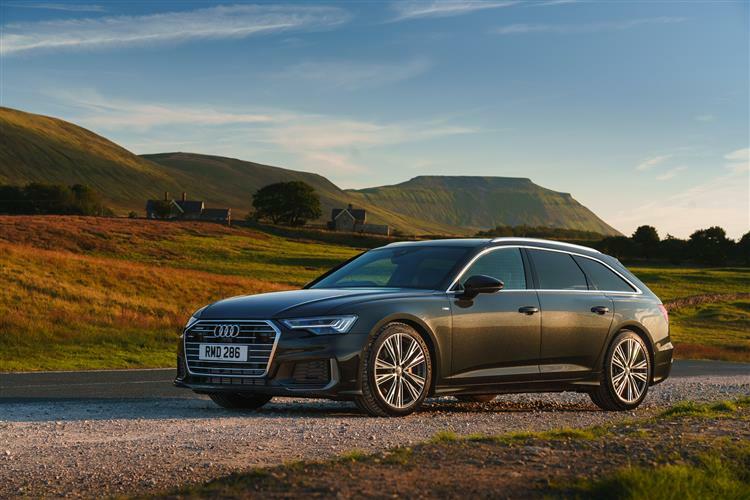 Their A6 Avant out-sells the rival BMW 5 Series Touring nearly two-to-one and is even further ahead of estate versions of other key segment competitors like Mercedes' E-Class and the Jaguar XF. What then, might the marque achieve with a car that's smarter, safer and clever? This one, the fifth generation A6 Avant. This isn't the biggest model in its segment but for many buyers, it offers the most complete all-round proposition in terms of model choice, practicality and technology, which explains why the other German brands take this contender so seriously. 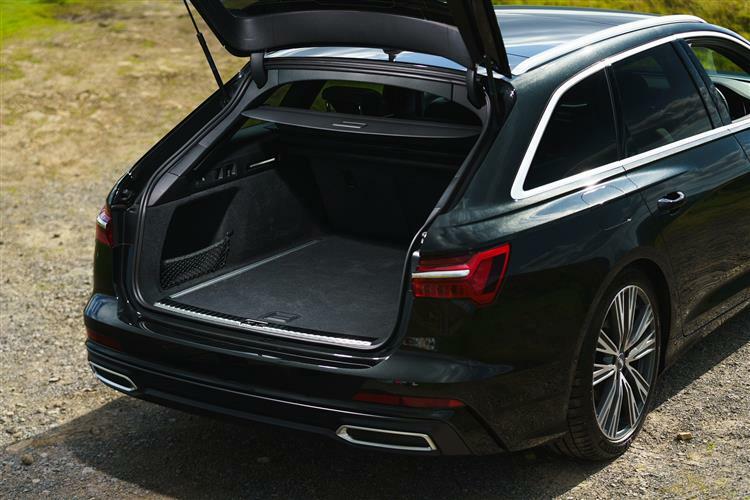 It's claimed to be the most complete large load carrier Audi has ever made. Let's check it out. Audi offers this A6 Avant with a wide range of engines, starting with four cylinder options at the foot of the range. The brand thinks that ideally though, most customers will want to try the mild hybrid technology used in its two powerfully smooth six cylinder engines - one a TFSI and one a TDI. 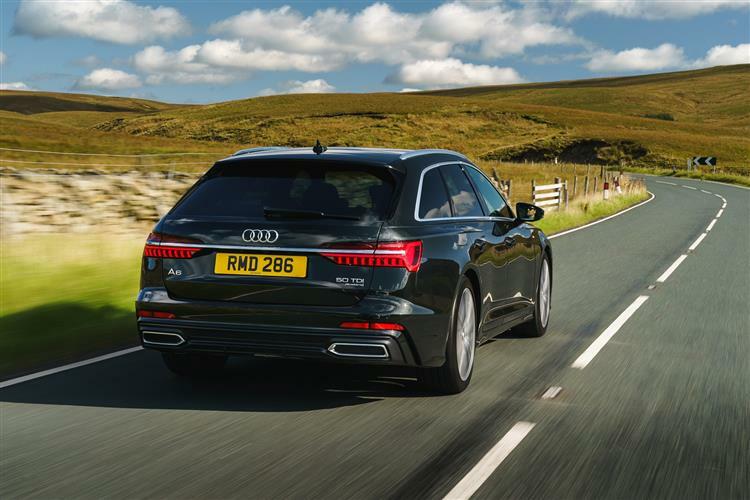 The 3.0 TFSI V6 turbocharged petrol unit powers this estate from rest to 62mph in just over 5 seconds using its 340PS and 500Nm of pulling power, topping out at an electronically limited 155mph. More popular though, will be the 3.0 TDI diesel with 286PS. This unit delivers similar performance thanks to 620Nm of pulling power. 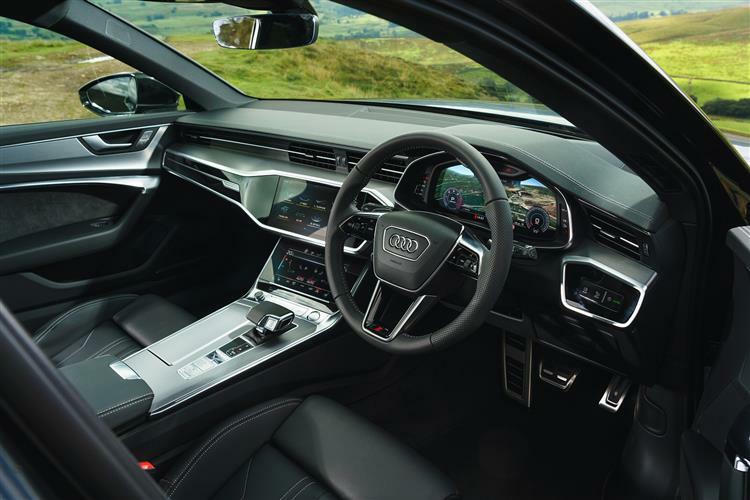 As before, all A6 models are exclusively equipped with automatic transmission. The 3.0 TDI unit is paired with an eight-speed tiptronic and the 3.0 TFSI with a seven-speed S tronic. Both engines channel their outputs through quattro all-wheel drive as standard. In conjunction with the tiptronic transmission, the quattro configuration is based on the more familiar self-locking centre differential format, while the S tronic transmission works with the even more efficient ultra variant, which is capable of engaging the rear axle instantly whenever needed but decouples it during cruising to maximise efficiency. 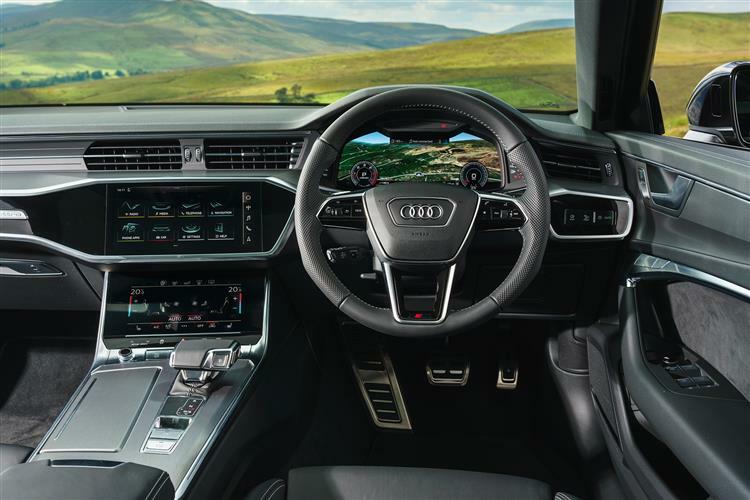 The driver can select various driving profiles via the Audi drive select system - the wide spread from Comfort through to Dynamic is even more pronounced than in the outgoing model. 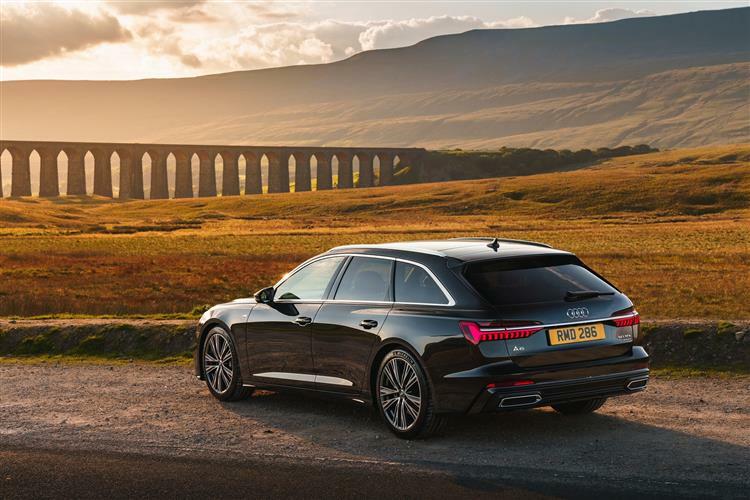 The swept back rear styling means, says Audi, that it won't have to produce an extra stylised large estate model like the Mercedes CLS Shooting Brake. You might wonder though, whether this will impinge on practicality. Apparently not. The boot capacity with all the seats in place remains at 565-litres, aided by a boot floor length that's 27mm longer this time round and particularly wide, at 1,050mm. Drop the rear 40:20:40 split-rear bench and 1,680-litres of space can be freed up, again, the same as with the previous generation model. 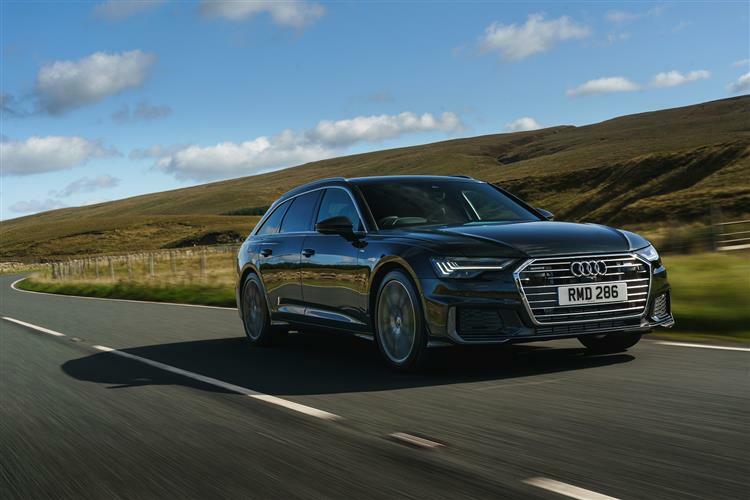 These figures can't match those of a rival Mercedes E-Class Estate, but Audi thinks potential executive buyers won't care, being attracted by the sleeker looks of this A6. The tailgate and luggage compartment cover open electrically as standard and of course, there's the option of doing that with a wave of your foot beneath the bumper. For passengers, the cabin is more spacious than before, with class-leading front and rear elbow room and rear knee room. Up front, the dash features the black-panel design we first saw on the current A8. As there, the centre console is directed towards the driver, as is the top MMI touch response display, which almost disappears into an aluminium clip when switched off. 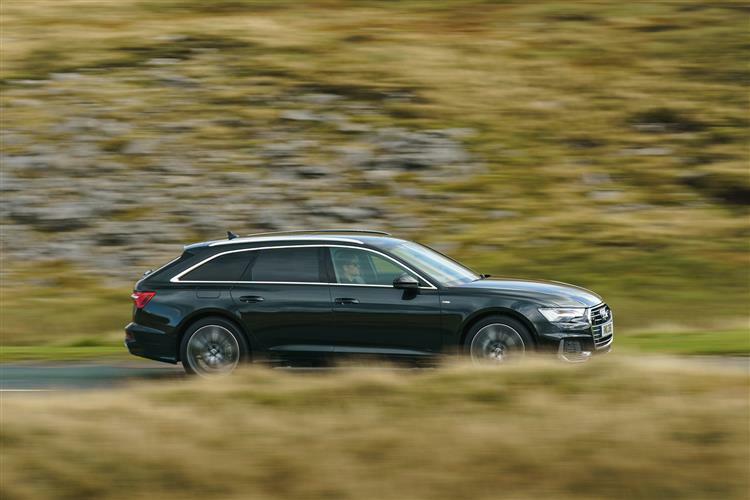 Expect a premium of just over £2,000 to own an A6 Avant over the saloon body style. That means asking prices similar to before, starting from just over £40,000. As before, this car's three key rivals will be the Mercedes E-Class Estate, the BMW 5 Series Touring and the Jaguar XF Sportbrake. You'll need to get your A6 Avant's spec right. There are four suspension set-ups: the conventional steel spring suspension, the sport suspension, the suspension with damper control and the adaptive air suspension, also with controlled damping. 'Progressive steering', which becomes even quicker and more direct as the steering angle increases, is standard. And dynamic all-wheel steering can also be added to further enhance this agility. Plus you can add in various autonomous driving features. And even specify Audi's 'parking pilot' and 'garage pilot' systems that will allow you to stand outside of your A6 and remotely park it: brilliant. A sophisticated MMI navigation system comes as standard - or you can add the optional 'MMI navigation plus' set-up. This has a media hub with high speed data transfer using the LTE Advanced standard. With this more advanced infotainment package, you can further add optional modules, including two sound systems headed by the Bang & Olufsen Advanced Sound System delivering 3D sound. Audi connect online services also provide clever 'car-to-X services' traffic sign and hazard information. They use the swarm intelligence from the Audi fleet and network the Audi A6 with its environment. Both the six cylinder engines in this fifth generation A6 Avant feature the brand's latest mild-hybrid technology. Here a belt alternator starter (BAS) works together with a lithium-ion battery, enabling the A6 to coast at speeds of between 34mph and 99mph in the interest of fuel economy and to initiate its start-stop function earlier - at speeds of 13mph and below. The engine is restarted from standstill predictively as soon as the vehicle in front starts moving. During deceleration, the BAS recovers up to 12 kW of energy. Let's get to the figures. The volume 2.0-litre 40 TDI diesel version manages 60.1mpg on the combined cycle and 124g/km of CO2. The 3.0 TFSI petrol unit delivers combined fuel economy of around 40mpg (depending on wheel size and trim choice) and CO2 emissions of around 160g/km. The 3.0 TDI delivers combined fuel economy of just over 45mpg, plus combined CO2 emissions of around 155g/km. We'll finish by covering the warranty. All cars in this class get three years of cover, but whereas BMW and Mercedes don't limit your mileage in this period, Audi rather meanly restricts you to 60,000 miles. Optional extra-cost packages can extend the cover to either four or five years. This, even BMW and Mercedes would reluctantly have to admit, is a beautiful piece of engineering. It always has been. The A6 Avant was, after all, the first cars in its class to offer things like bonded-in flush glazing, a galvanised bodyshell, V6 TDI power, four wheel drive and advanced twin-clutch automatic gearboxes. And in this improved smart-suited fifth generation guise, the cleverness continues, an extra dose of visual charisma blended with high technology and premium quality unsurpassed in this sector. This car's drawbacks, such as they are, don't appear to bother many potential buyers. No it's still not the most spacious large executive estate in its class - but these days, it's large enough for that not to matter. Yes, the extras can be expensive, but then that's the case with any premium executive car. And it's true that the handling isn't especially aimed at driving enthusiasts, though you can go a long way towards sharpening it by tweaking the 'drive select' dynamic handling system or even by specifying the clever Sport differential. This then, is a very complete product that will doubtless continue as one of the leaders in its class for many years to come. A thorough case, if ever there was one, of vorsprung durch technic.